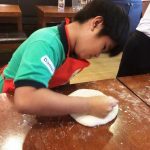 My 10-year old son would always help his momi with the cooking or baking. He would do the batter for our pancakes and waffles, and would even blend the milk with other ingredients for our refrigerated cakes or pies. 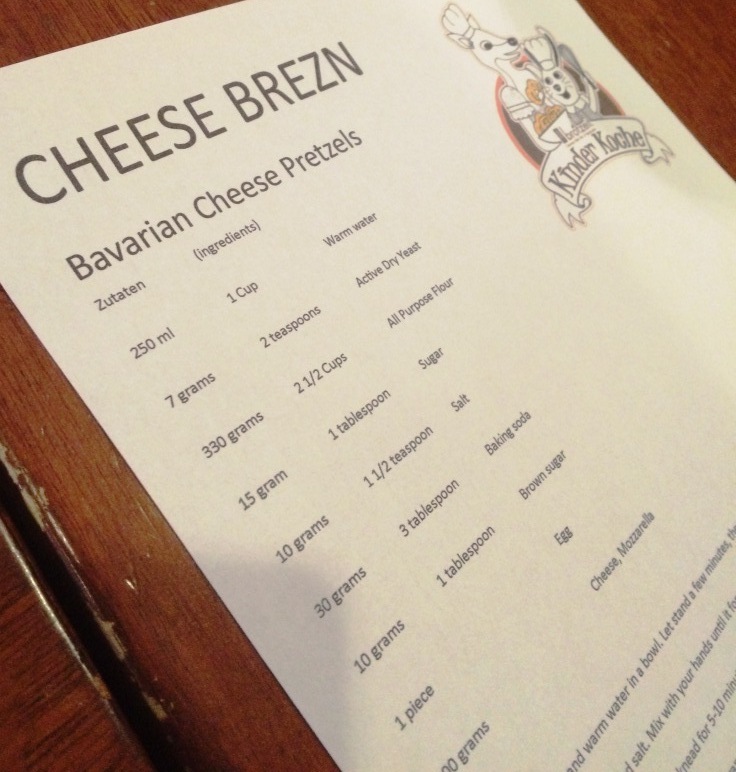 So when I learned that Brotzeit will be having a Junior Chef @ Work workshop for kids, I readily enlisted my boy. Brotzeit, by the way, is a restaurant just outside Shangri-la Mall and offers world-famous German beers and authentic bavarian cuisine. That same day after the workshop, he relayed to me on our way home that it was one of his most memorable summer activities. This mother was all the happier to hear the good news. Let me recount the fun activity for you. 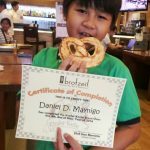 You might also want to enroll your kids at the Brotzeit Junior Chef @ Work. Brotzeit Chef @ Work will happen every Saturday of May. 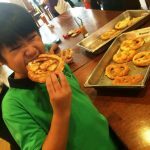 Kids from five to 10 years old will learn how to make their own fladen, cookies, and pretzels. They will have their little hands busy and all dirty as they follow the simple steps to baking. They will be given aprons and will use real cooking tools. At the end of the day, they will surely end up so proud of themselves after seeing their creation. And of course, they get to bring home the pastries they have made plus flaunt to their friends a certificate of completion. 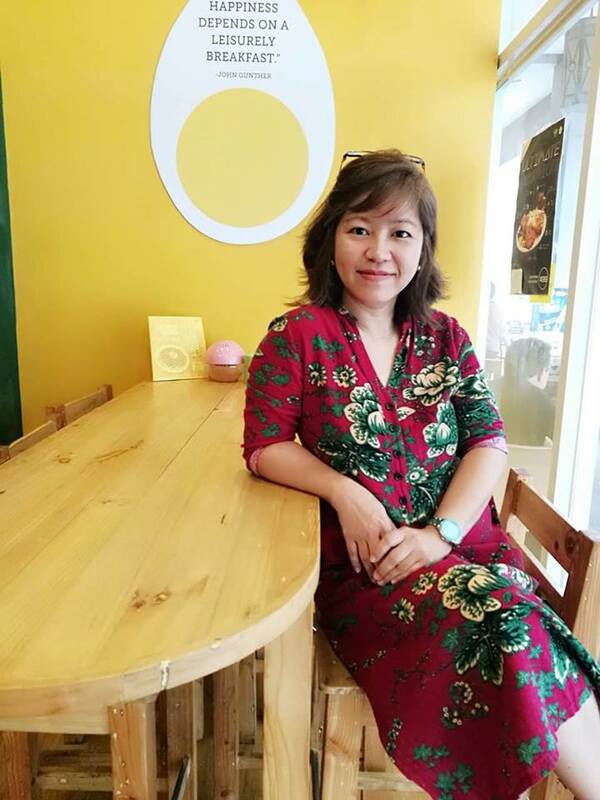 When this mother and her son entered the Brotzeit German Bier and Restaurant, they were greeted by the amiable team of Ms. Malou Gonzalez, Brotzeit PR and Marketing Manager. She then introduced Chef Ivan Maminta. The good-looking chef wasted no time and readied his class for the workshop. Everyone, though all giddy, was all ears, ready to make some dough and mold them into gigantic pretzels. 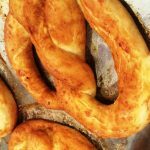 Yes, my 10-year old just learned how to bake some Bavarian Cheese Pretzels! 1. Combine the flour, sugar, salt, and cheese in a bowl. Add water and mix with hands until it forms a rough ball. 3. 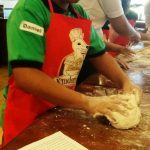 Roll the dough as long as your arm then divide it into six equal pieces using either a pastry scraper or a knife. 4. 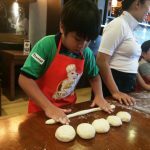 Roll each dough into a long skinny rope, about 20 inches long with both your hands. 5. Form the pretzels. Dip it into a bowl of water, sugar, and baking soda. 6. Transfer the pretzels into a parchment lined baking pan. Bake at 115C for 20 minutes until deep and glossy. Brush with softened butter and sprinkle with cheese. Serve hot! The workshop lasted for about 2 1/2 hours and the energy level of the kids didn’t even dwindle. 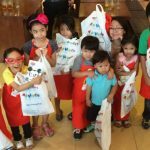 They were all the more ecstatic to receive their certificate and some gifts from event partner Toy Kingdom. 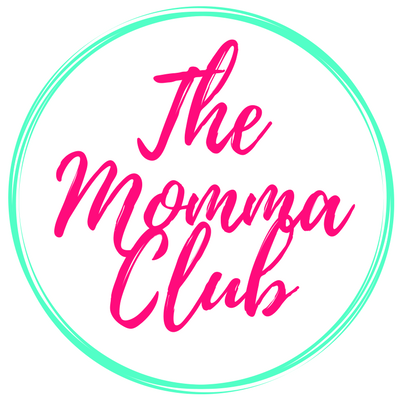 The mommies, on the other hand, received a gift box from Cucina. Baking instills confidence in our children. Knowing that they have started and completed a task helps build or boost their self-esteem. Baking is all about following directions. And because they are kids, they tend to get distracted by things and movements around them. Enrolling them in activities like baking or cooking is an extremely good way to reinforce following directions. One applaudable character of Chef Ivan was the way he gave his instructions to the kids. He recited the steps then showed the process to the children. He did not leave my son until he got what was asked of him to do. It pays to start early. 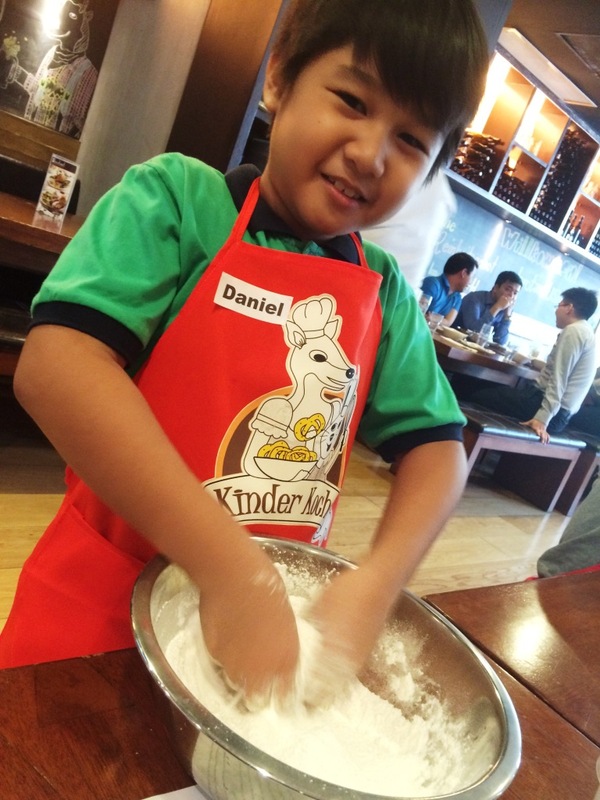 As a mom, I encourage you to enroll your kids now at Brotzeit Junior Chef @ Work. 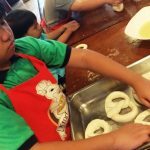 Let them experience the fun of being Junior Chefs and help them develop their confidence and ability to follow directions. 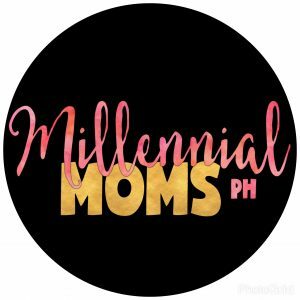 For details, you may check my previous post here. I love that he enjoyed this. I think cooking in the kitchen is such a great skill and like you said it instills confidence. I love being able to learn something new and so I love for kids to do the same. Those pretzels looked great! What a great experience this must have been for him. They have a reality show here that features kids. I love pretzels so much. This is wonderful. 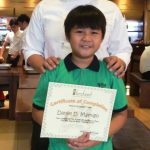 You can never start children early enough in different activities where while having fun they learn not only social skills, but other skills that will help them in the future. You are doing a great thing for him. I applaud you for that. Thank you. Ow, yes, forgot to mention that such activities are also good to develop his social skills. Plus the measurements, thank you for reminding me. When i ask the boys to prepare the batter for our pancakes or anything we need for baking, they will really follow the measurement. So unlike me that i often guess how many cups or teaspoons to use. Haha. Haha. How I wish. But really thank you that there are indeed establishments and even restaurants offering such classes. How i wish! But really i am thankful that establishments and restaurants such as Brotzeit offer baking classes like this. You are welcome. 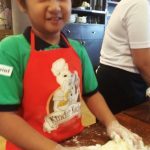 Surely kids would enjoy and learn a thing or two from the chef and from the activity. Yes, we now have a junior chef at home. Ihihi. The baking with your son, the Junior Chef himself haha, tuned out so well. The pretzels look really tasty. It’s fun to see the whole process. 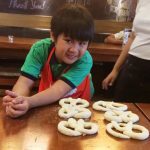 As he made the dough and then they turned out into masterpieces of pretzels! Yes, it was a fun workshop. 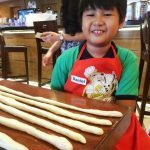 Looking forward to more baking and cooking workshops with my boys. 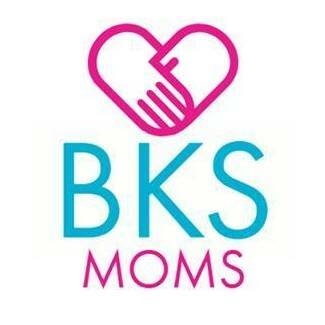 I’m not a Mom nor do I have kids, but this is an activity that I would recommend. It’s a fun way of learning and not typical as well. 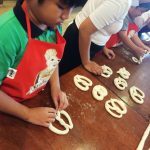 Kudos to Brotzeit for opening their doors to kids through this workshop. I like it because it’s interactive and like what you said, teaches kids discipline & how to follow directions. I like how these kinds of activities also promote Math ( lol, a lot of Math in baking & cooking ) and art!